I have a 12 week old GSD male that until last week, he had both ears up. Now one has dropped. Is there anything I should be concerned about or do? Personally at that age I wouldn't really worry about it too much. In fact, you can probably expect the ears to be up one day and down the next for a few more weeks as the puppy matures. 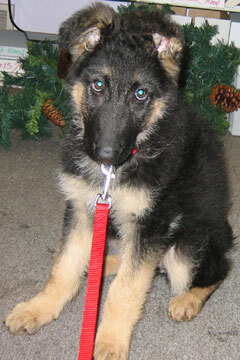 But if you want to learn even more about those German Shepherd puppy ears then please check out this page for more info. You really don't have to worry too much until the puppy gets to be 5 months or older and the ears aren't up completely on their own. Even so, the link above about the German Shepherd puppy ears will give you details on what to do about taping the ears up if you ever need to do so. So, good luck with your German Shepherd puppy. Well, thank you for your advise and comments. Max is now 16 weeks old and both ears are now standing straight up. again, thank you for your information. I have raised GSD's for 19 years...I have always heard that the larger the dog, the longer the ears take to stand. I do raise over-sized and it seems to be true. Also, don't worry just yet, until they are totally done teething, ears go up and down.